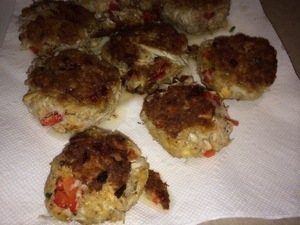 In a large bowl combine crabmeat, crackers, bell pepper, green onion, egg, butter, salt and pepper, mixing well. Shape into 8 patties, and place on a baking sheet lined with plastic wrap. Cover with plastic wrap, and refrigerate for at least 30 minutes or up to 1 day. In a large nonstick skillet, heat 1 tablespoon vegetable oil over medium high heat. Cook crab cakes, 2 at a time, for 4 to 5 minutes per side, repeating the process until all crab cakes are cooked, adding more oil as needed. Drain on paper towels. Keep warm until needed.